Highline Crossing began forming in 1991 and our community-designed homes were completed in stages between 1995 and 1997. 20+ years have given us time for the trees to grow and for us to grow some of our own traditions. We have put our own spin on an eclectic mix of holiday and celebratory events like our annual OktoberFest, St. Patrick's Day, and Christmas Eve dinners, our annual Art & Talent Show, and more. Regular events include community meals or potlucks, workdays throughout the year, and of course, community and team meetings! Amenities include a community garden with individual garden plots, common gathering areas, and guest quarters in the Common House. Highline Crossing also offers immediate access to the Highline Canal Trail system (over 70 miles of foot/bike/horse trails, just across a footbridge). There is a wide variety of cultural and sporting activities locally. 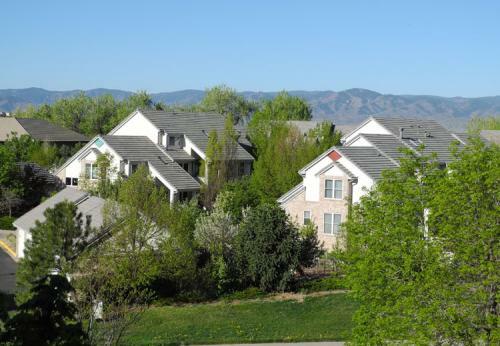 The community is less than a mile from the light-rail system with easy access to downtown Denver.